New laws are forcing companies to rethink their website’s design to incorporate ADA (Americans with Disabilities Act) features. 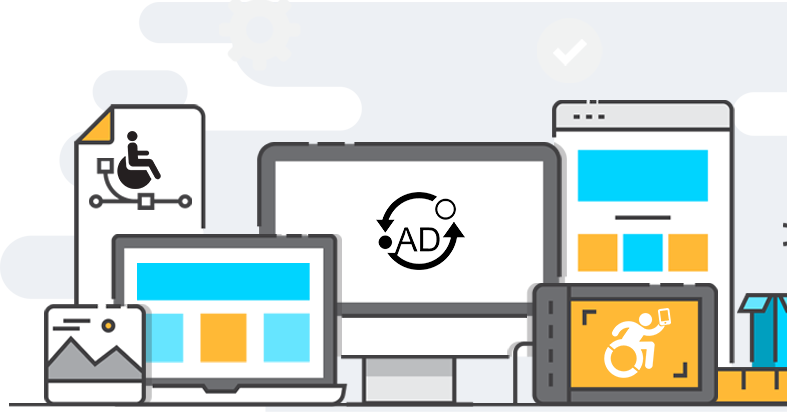 When it comes to understanding ADA compliance, WCAG 2.0, Section 508, and 2018 refresh compliance, we understand how to make your website compliant on time and on budget. We offer a professional process that works with the online presence of small companies to large Fortune 500 corporations, to provide you the information you need based on a detailed ADA compliance audit and report of your website(s). WHO SHOULD BE ADA COMPLIANT? As of January 2018, federal institutions must have compliant websites and the general consensus in the current legal landscape is that any business considered a “public accommodation” should provide a website or online presence that accommodates users with disabilities. Title III of the Americans with Disabilities applies to private businesses and has expanded to applications in the online and mobile application spaces. Although “public accommodation” can be vague, it can certainly cover retail business or a business that offers goods/services the general public might use. Consumers are more frequently succeeding in ADA lawsuits against private businesses and rates are likely to increase in light of new ADA regulation affection a business’ online presence. WHAT DO I NEED TO DO TO MAKE MY WESBSITE ADA COMPLIANT? Contact us today for more information regarding performing a compliance audit and making your website conform to ADA, WCAG 2.0 and Section 508 guidelines.